I'm reading Test-Driven Development by example by Kent Beck, the original book where TDD was presented to the public. I'm getting many insights on the Red-Green-Refactor process, but one thing is becoming clear (and it is also explicitly stated): TDD is not a substitute for design choices. It gives you a quick feedback about the current code design, its testability and coupling; but choosing metaphors, names and patterns is up to you. Unless you were once bitten by a radioactive Kent Beck, your design-sense should be nurtured with practice, like any other skill. Here are my articles published this week, some of which regard testing as well. 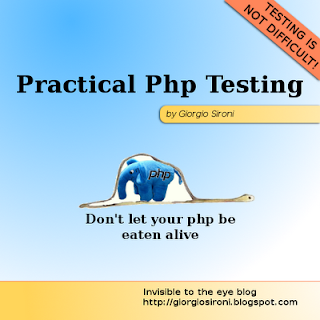 Practical PHP Testing Patterns: Configurable Test Double is the main method for building Test Doubles. How to enrich lawyers explains the goals of the patent system, and its many issues. Practical PHP Testing Patterns: Hard-Coded Test Double is a type of Test Double written by hand, and very explicative.